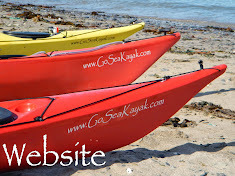 Go Sea Kayak Blog: Riding On Giants..
Gareth Jenkins contemplating the race. Elan Rhys Winter was getting stuck in too! And having far too much fun! So that was it, another fab day out but one without many pics as I was keeping a firm grip on my shaft!